The South African utility City of Capetown Electricity has started replacing a number of sub-stations in Cape Town. At this moment, these stations are equipped with GPLK cable, and in the new situation this cable must be connected to the new polymeric cable. Lovink’s LoviSil® transition joints provide a solution for this. The joint is universally applicable and the silicone mass that is used to fill the joint prevents the paper-insulated cable from drying. The installations are performed by CBI-Electric Power Installations, a contractor who works for many utilities in South Africa. The installation of 3-core and single-core 36 kV transition joints was supervised by Lovink and its distributor KBK Power Solutions. 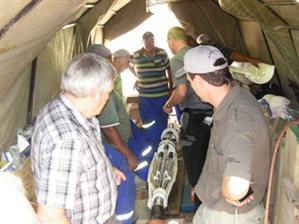 The people at both CBI and City of Capetown Electricity can look back at a successful installation.